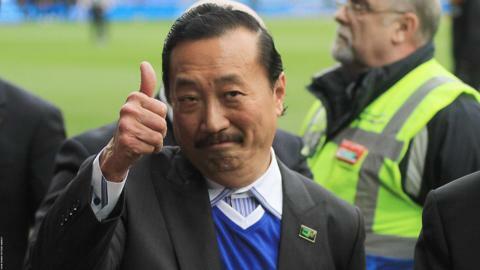 Russell Slade has urged owner Vincent Tan to visit Cardiff City more often. The Malaysian entrepreneur watched Cardiff's goalless draw at Charlton on a trip to the UK where Tan announced he plans to halve the club's £140m debt. Tan also advised the draw-specialists to "shoot more" and manager Slade thinks his presence lifted a side still targeting the Championship play-offs. "I would argue that it would be better if he was over more often, in many ways," said Slade. "I know that is not easy because he is a very busy man. But to have him around the football club would, I think, be a very very positive thing. "I think the players enjoyed his visit. I think they welcomed it, embraced it because he does not come over that often, so to see him and for him to meet some of his new players as well was, I think, a really good thing." The Charlton stalemate, Cardiff's 13th draw this season, was the second Cardiff game Tan had seen this season and the billionaire has not attended a home game since January 2015. Cardiff, who host third-placed Brighton and Hove Albion on Saturday before going to second-placed Middlesbrough on Tuesday, are unbeaten in 10 league games at Cardiff City Stadium. This is Cardiff's second season back in the Championship after their Premier League relegation and Slade has come under pressure this season from Cardiff fans for the team's style of play. But the Cardiff boss has lost strikers Kenwyne Jones and Joe Mason because of "financial reasons" and was glad to see Tan. "I think he came across very passionate and he still had a real strong interest in the football club going forward," said Slade. "I think he has realised what a difficult time it has been over recent months financially for the football club and for the football club to be gaining a little bit more stability on and off the field. "Sometimes when you are relegated from the Premier League times can be tough for the football club and Cardiff are no different. "We have gone through that as a club and fingers crossed we are coming out the other side now."